Tipping with a Gift Card - when a gift card is redeemed, the customer receives a second receipt where they can add tip amount to their gift card. Auto-Redeem - instead of having to run a balance inquiry before each transaction, servers can simply attempt to redeem the total amount of the check and if a lesser value is available on the card, that amount will be applied to the check. Balance Checker - we provide you with a branded website and web services API where customers can check a card balance directly through your own website without being redirected to an outside webpage. POS Tracking - by fully integrating our platform in to your POS, card sales and redemptions are tracked separately and instantly, putting every transaction into the right category for accounting. Flexible Sales - for escheatment purposes, you can categorize gift card sales as a non-revenue service charge or as a sales item. By selling cards as sales items, you eliminate the need for escheatment tracking and reporting as cards are simply posted to net sales. 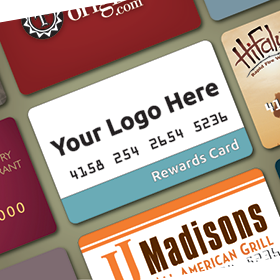 Our clients know they can count on PowerCard's stability and robust feature set to create and support a multi-functional and unique gift card program for your brand.